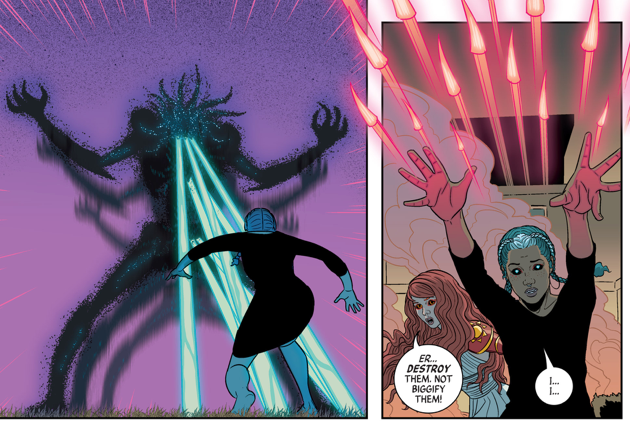 There are two drastically opposing forces at play in The Wicked + The Divine #26: action and inaction. The first half of this issue is action as Amaterasu, Persephone, and Baal fight off the Great Darkness at Baal’s mother’s house. Persephone’s role in this is interesting: she’s desperately trying to help, pulling Baal’s mother and siblings out of an attack by the Great Darkness but somehow her powers only make the Darkness grow. For all of Persephone’s bluster about her being “the Destroyer”, it’s obvious from these panels and her horrified expression after the fight that she doesn’t know as much about her powers as she had thought. The second half of the issue is inaction, almost exclusively in a nine-panel page format. To those versed in comics history, this is a familiar comics structure: comic titans Steve Ditko and Jack Kirby regularly used the nine-panel page structure in their 1960s work and the seminal classic Watchmen is comprised almost entirely in the nine-panel page format. 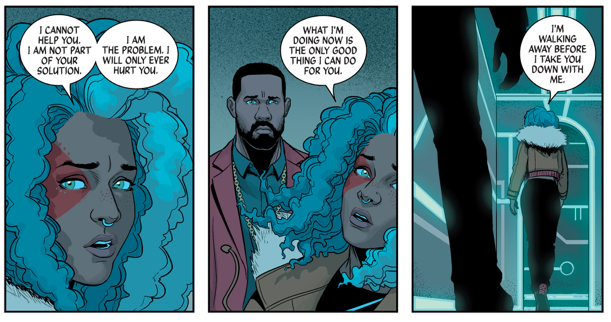 Writer Kieron Gillen and artist Jamie McKelvie are drawing upon the familiarity of this panel structure in order to highlight the familiarity of the conversation the gods are having. While the gods might be having a new debate as to whether to fight the Darkness, study the Darkness, or do whatever they want, the page style shows that they’re settling back into the familiar pre-Persephone patterns. As such, when Persephone disrupts the familiarity? It has a tremendous impact. As Persephone chooses anarchy, she pushes past the nine panel structure. A large headshot of Persephone takes up almost half the page, overlaid on top of a traditional nine-panel backing. There’s no traditional panel border, as twisting vines mark where the “panel” of Persephone’s decision ends, bleeding into other panels. This is a blatant disruption of familiarity…which is then immediately undercut as Persephone settles back into familiar patterns herself and the page structure reverts back to variations on the nine panel format. For the past few issues, Persephone has been presenting herself as a dangerous wild card, occasionally slipping too far into “darkness no parents” at the expense of any character development or character exploration. This continues as she breaks up with Baal, placing all blame on herself. I understand that this is probably because she herself has no idea what her status as the thirteenth god actually consists of and cares enough about Baal to prevent herself from hurting him. And I’m certain that she’ll eventually have a moment where she reconciles with the rest of the gods. But for the moment? Persephone pushing people away and slipping back into her veneer or not caring is getting aggravating. For a moment that follows an explicit break from the familiar, to instantly return to the familiar is disappointing. Amaterasu gets this issue’s MVP for her stunning observation that it’s actually the humans who are The Walking Dead, not the zombies. She’s not dumb, per se, but there are plenty of moments where Ammy’s endearingly slow on the uptake. I’m a bit confused by the fact that everybody’s shown up in their godly aesthetic…and yet Baphomet looks like he literally rolled out of bed before attending the godly meeting. Likewise, it’s deliberately confusing as to who interrupts Baphomet during the vote. One would assume the Morrigan, but the speech bubble is coming from Baphomet’s left and confusingly, Minerva is sitting directly to Baphomet’s left. This issue is so structurally tight that this small piece of ambiguity sticks out like a sore thumb. Someone who’s more versed in fandom than me can answer this question: was speculation that Urdr was asexual widespread in WicDiv fandom? Gillen and McKelvie are obviously aware of fandom, as shown by the cosplay images in the back of one Wicked + Divide trade and the Tumblr-style recap pages for one issue of Young Avengers and Urdr’s line of “And now I’m once again wondering why people always think I’m asexual?” seems like a fairly direct reference to that type of speculation…I simply don’t know if said speculation existed or not. Previous ArticleTV Review: Riverdale 1x03 "Chapter Three: Body Double"